The proliferation of technology and growing consumer engagement with all things digital are changing many aspects of customer behavior, from product research to buying patterns to banking. Consumer expectations are growing, too: consumers now expect a seamless, high-quality experience across all digital channels, including online and mobile. Financial Institutions (FIs) are responding to consumer demand by providing these channels and developing new systems and features to satisfy customers. They’re already reaping some of the rewards of digital banking capabilities, but much of digital banking’s transformative potential remains unrealized. 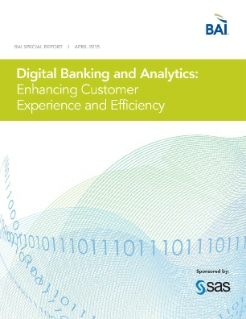 This paper presents the results of the April 2015 BAI Consumer Digital Banking Survey, demonstrating that consumers highly value digital banking services, both in how often they use these services and how they use them. It found that offering full-featured digital banking services can increase customer satisfaction for FIs, but doing so can also help them reach other business goals such as reducing costs and customer acquisition.